Whether you find them repulsive or think of them as cute, maggots and caterpillars share many characteristics with each other, including their general body shape. They differ on their general feeding habits and what they look like as adults, but both play vital parts in the ecosystem -- both good and bad. Both maggots and caterpillars are larvae, or the first life stage for many types of insects after the egg. Maggots are the larvae of flies; caterpillars are the larvae of moths and butterflies. Both often hatch in large numbers due to their mothers laying clutches of eggs, but not all, as some are laid in individual locations. After hatching, these little babies are hungry -- so hungry that they will immediately begin feasting or travel to their host, which isn't too far away. In fact, the larval stage is sometimes referred to as the feeding stage; many adults do not feed. Both of these babies have similar life cycles and undergo complete metamorphosis, meaning they go through complete changes from baby to adult. Once the larvae hatch and begin feeding, they go through stages known as instars. The number of instars varies between families, genera and species, but each instar results in growing. After they complete their final larval instar, both maggots and caterpillars pupate. They make pupal cases or, in the case of many caterpillars, extravagant cocoons or chrysalises in which they go through a transformation into their adult form. Both maggots and caterpillars share the same, almost worm-like body shape, making them look -- superficially -- alike. Many maggots are whitish in color or cream, and many have a distinctly darker face, or head. Maggots often don't possess legs or leg-like appendages like their caterpillar and grub counterparts, however. Caterpillars, on the other hand, are often colorful creatures that have markings to help camouflage them while they forage. The term "beneficial pest" may seem like an oxymoron, but it applies to many maggots and caterpillars. For example, the site of a wriggling group of feeding maggots on rotted meat may make your stomach turn, but they're often one of the first organisms to begin decomposing trash and dead animals. 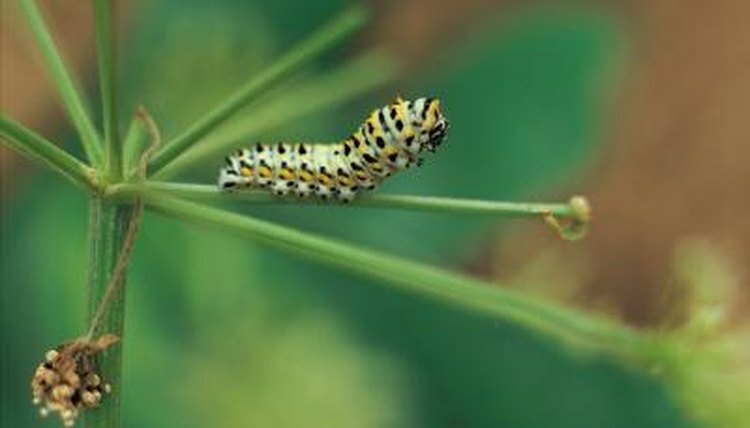 Certain species of caterpillars, on the other hand, can quickly ruin your vegetable garden by devouring leaves, fruit, roots and other parts of the plants. Adult moths and butterflies, however, are often important pollinators for many species of plants. What Is the Difference Between a Ladybug & a Darkling Beetle? Do Termites Look Like Maggots? What Types of Bugs Have No Legs? What Happens to Caterpillars in the Winter? What Is the Difference Between a Silverfish & a House Centipede?